The home dreams are made of! Custom built for owner, this story book property in Haile Plantation is always a show stopper. The welcoming brick and column lined front porch leads to a center hall traditional with gleaming wood floors. Boasting new roof in 2014 and 2013 HVAC's, this home is impeccably maintained. 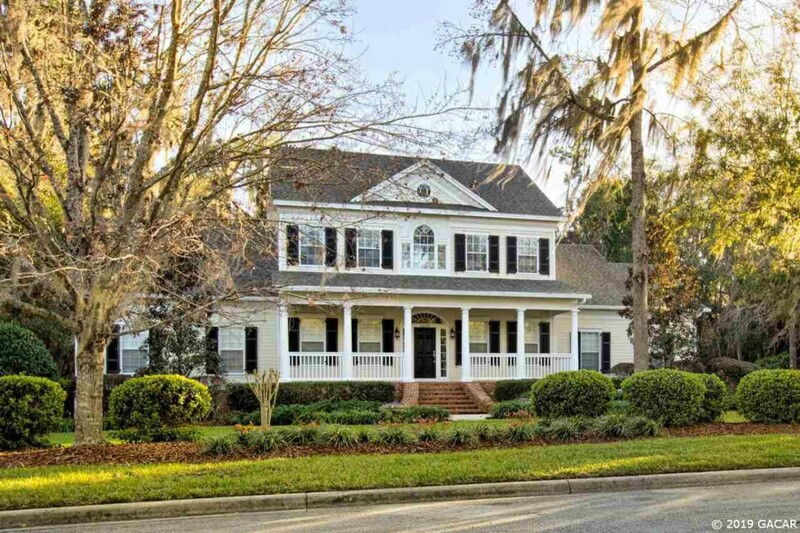 Large formal living and dining rooms features stunning custom millwork, crown molding and plantation shutters. Two story family room lined with french doors to pool area features built ins and gas FP, opens to kitchen/breakfast room. The cook's kitchen with 42" wood cabinets, granite, two ovens, micowave and bev. fridge in island is the heart of the home. A real bonus is the light filled sun room lined with windows. Rounding out downstairs is a study and large master with two walk in closets and glamour bath featuring jetted tub and walk in shower. Upstairs are three guests rooms, one w/ en-suite bath and a large flex/bonus room. Large walk in attic is storage heaven! The pool/patio area is party ready with covered brick lanai, raised sun deck and free form heated pool. Under house storage is a perk!